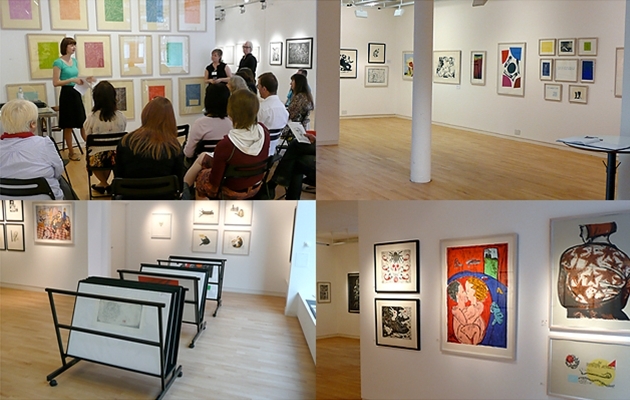 In 2007 Glasgow Print Studio was awarded funding from the Heritage Lottery Fund to enable the Archive to be enjoyed by wider audiences. GPS's Archive is a valuable resource which covers nearly forty years of fine art printmaking in Scotland. It contains prints and related items including original blocks and plates, associated drawings, press cuttings, photographs and correspondence. There is also a significant amount of material relating to the history of the workshop and to exhibitions. This collection is not only unique in representing later 20th century printmaking developments in Scotland but is also a significant collection of artwork by major Scottish artists. The Past Impressions project allowed conservation and cataloguing of the collection and has been used throughout the learning programme. Our new premises at Trongate 103 include an Archive Room and designated Learning Zone. As part of this exciting project we appointed a part time Project Curator who was responsible for cataloguing the works into an accessible archive and managing the safe relocation of the Archive. We recruited five volunteers, with an interest in fine art printmaking and museum/gallery work to help catalogue, package and relocate the archive into our newly refurbished venue. The project provided participants with key skills and experience in handling and cataloguing artwork and other archive materials. We also ran workshops for schools, where pupils learned about printmaking and worked with artists to create their own prints. Towards the end of the project we worked with a group from the LUV Gallery in Linthouse to select works for the Past Impression exhibition, our first show in Trongate 103. The legacy of the project is our new Archive Room, equipped with new plan chests and custom-built storage units. We have also been able to embed the Archive into our Learning Programme, something which will be continued. The collection is now much more easily accessible and is safely stored and protected for the future.